I stumbled across a superb video that really demonstrates why certain types of scissors are better than others in the planted aquarium and this YouTube clip is a great example. First you need to make sure they are made of stainless steel otherwise they will become rusty very quickly and won’t operate as you want. Rusty scissors need to be discarded and you don’t want to put them into your aquarium. They need to be sharp. Poor quality scissors are often cheap to buy in the first place but also need to be replaced quickly (false economy). They become blunt and simply bend when you try to cut a thicker stem. They need to be comfortable in your hand – you may be using them a lot in a CO2 infused planted aquarium. Better to invest in a quality pair if this is a concern. Apart from that there’s not really too much more to write about the subject. 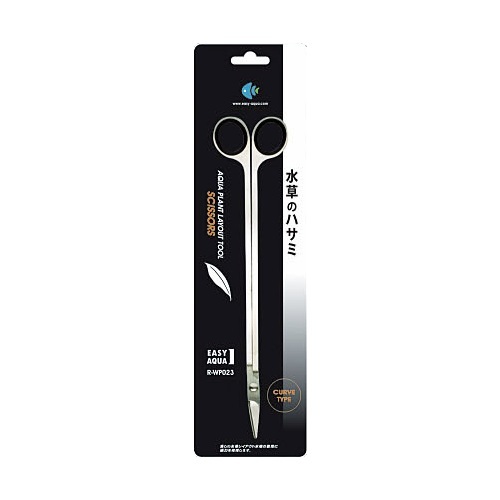 If you want the same style as was used in the YouTube clip then the Easy Aqua Curved Scissors are the pair for you. With the economic downturn we are all looking for savings to be made, but there are a couple of things to keep in mind. One is that looking for savings is a good move, the other is that cutting corners where it involves safety is not. Below I list three items that you should get brand new, they usually go wrong quickly and have a high fail rate. Why shouldn’t you get an aquarium heater second hand? With so many offers online for second hand items, the aquarium heater is one that you should get new. Many aquarium heaters fail, either they get stuck on the one position or they fail to heat up the water. Both will kill all your livestock. Many fish keepers spend hundreds if not thousands on their tank, on substrate, lights, rocks, fish, etc, yet many people do not think twice about buying a heater second hand. Do you actually know what is inside a open bottle? Would you buy juice from a shop if the bottle was already open? Same with aquarium products. Don’t bother with half used bottles. First many products have a use by date from the date they were open, and you do not know when they were open, secondly you do not know what else is mixed on it, and last the savings you may made will not matter if something goes wrong. Buy from a reputable shop and have peace of mind. Many filters rubber rings have a usable life, same as it happens to your car, many items wear off after a while, and they need to be replaced. Would you like to come home and have half the tank water on the sitting room floor? There are so many diffusers on the market these days it’s probably a hard decision as to which one you should use. The problem is there’s not a great deal between them so this makes your decision even harder. So I’ve decided to focus on just one – it looks great and functions well too and it’s called the AE Design 150L Spiral Glass CO2 Diffuser. What’s special about this product? As you can see, because of the spiral, it doubles up as a bubble counter which means you need one less piece of equipment. This glass diffuser is suitable for aquariums up to 150L but if your tank was a little larger, I don’t think it would cause a problem. Similarly if you have a smaller aquarium and are particularly fond of the spiral (it is nice isn’t it) then you could still use this diffuser. Remember the lower the pressure on your regulator, the less bubbles come out of a ceramic plate. The higher the pressure and bubbles come out of them everywhere. Cleaning glass diffusers is easy – algae builds up on the plate every couple of weeks so to keep them fresh, soak them in a neat bleach solution over night, and then in the morning give them a thorough rinse under tap water for about a minute making sure it’s nice and clean (and bleach free). For our range of diffusers, follow this link. What’s the flow rate like in your planted aquarium? Anything like Mark’s? Are you a writer or maybe you just fancy doing some writing on the subject of planted aquariums? We are opening up our blog to hobbyists just like you. With the importance of fresh content on blogs, we are inviting anyone who fancies writing on the subject of planted aquariums. It can be about anything you like but must revolve around this wonderful hobby. Perhaps you have had some experiences you would like share with others or maybe you are a long term hobbyist and want to say a few words about how keeping a planted aquarium has changed over the years. We believe this planted aquarium blog is the most active in the world which makes it pretty special. It also means you get high readership which is a bonus too! We’re not committing you to anything though, you can write when ever you like and will be provided log in details so you become a Contributor. The only aspect that needs to be considered is commercial sensitivity – you can’t say certain products are rubbish or don’t work for example. Small planted aquariums can be difficult to illuminate and as a result some tanks will be harder work than they should be. Getting the right sort of lighting first time round will save you time, money and hassle, so this blog post should direct you to the right place. Each unit is 28x6x6cm and finished in a silver plastic. It clips on neatly to the side of the aquarium and once you switch it on, you’ll be amazed at how much light it kicks out. To see the range visit this link. Many hobbyists keep doing the same things and expect to get different results – which after reading the above makes you insane. Now of course this is an exageration, we don’t really think you’re mad but it’s making people aware that they need to try something different if their planted aquarium is not going the way they expect. Lets look at an example of yellowing leaves. Customer notices some of the leaves on their crypts going yellow and thinks that’s strange but ignores it hoping it might go away. Now yellowing of leaves normally indicates a nutrient deficiency so the remedy – add more nutrients. Next couple of days the situation is no better, in fact it’s worse. More leaves are yellowing and no more fertilisers are being added. This fictional story happens all the time and I encourage you to do something different if you’re not getting the results you expect. In this situation if you added more fertilisers you would notice a positive difference. Leaves would begin to look better. The exciting part and the one reason that you became interested in this hobby. These wonderful aquatic plants make your aquarium come alive with lush colours of green and red. Now the difficult part of choosing what plants to grow! It’s important to do your homework before you choose which plants you keep in your tank. By doing some research you save yourself both time and money. Many hobbyists make the mistake when they go into a fish shop and are amazed by certain plants that look beautiful, may be a lovely red colour or a certain shape or size. They take them home and gradually they deteriorate. You’re left puzzled and confused as to why they didn’t grow and flourish. Not all plants are suitable for aquariums. I’ve been in countless shops that sell non aquatic plants, so no matter how good your conditions are these plants will always fail. Shops only sell these plants because they know as soon as they are placed in your aquarium they begin to die – they hope rather than do your research you will come back and buy some more. I’ve never understood that concept and surely it’s better to educate customers so that they come back and buy a much broader variety of plants as their skills expand. So just beware of what plants are aquatic prior to purchase. Crinum Thaianum, Echindorus Parviflorus, Java Moss, Lilaeopsis Novea-Zealandie, Marsilea Crenata, Micromanthemum Umbrosum, Microsorium Pteropus, Nuphur Japonicum and Vallis Spiralis. There are many others that are suitable simply check the label and marry that up against your tank set up. If a plant requires high light you can be sure it needs CO2 – this is typical of red plants. View the range of plants here. Most plants are grown in pots – make sure they have roots. When you get them home remove the pot and rockwool carefully and split into about 6 plants. Tall plants must always be planted at the back of your aquarium are are ideal for covering up filters or heaters. Medium sized plants are most suitable for the midground and small plants are typically suited for the front of the tank to avoid obstructing the plants behind. Foreground plants often the most sought after because of the way they look and grow. They also spread rapidly given the right conditions and can really transform an aquascape.